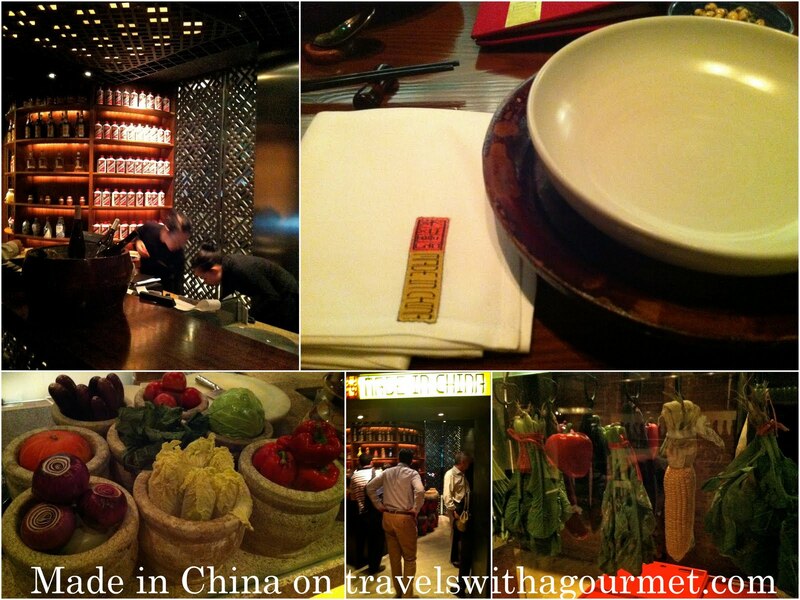 After a whole day of sightseeing, we were looking forward to our dinner reservation at the Grand Hyatt’s Made in China which was highly recommended by several friends as the best place for the city’s eponymous Beijing Duck (a.k.a. Peking duck when the capital was still called Peking). We were meeting R & L at 8:00 p.m. and were advised to leave our hotel an hour before as rush-hour traffic in Beijing can mean double the usual travel time. When we got there fifteen minutes early, they were already waiting for us at the bar so we went straight to our table. The restaurant was packed for a Friday evening with all seats taken and several waiting at the bar for tables to free up. Made in China is a long narrow room flanked by the bar, a private dining area and several open cooking stations – a steamy dumplings section, a wok-fried section and a wood-fire brick oven where the ducks are roasted. We had pre-ordered a Beijing duck (24-hour notice needed for this and their other special dish, Beggar’s chicken) so we knew what our starter would be. 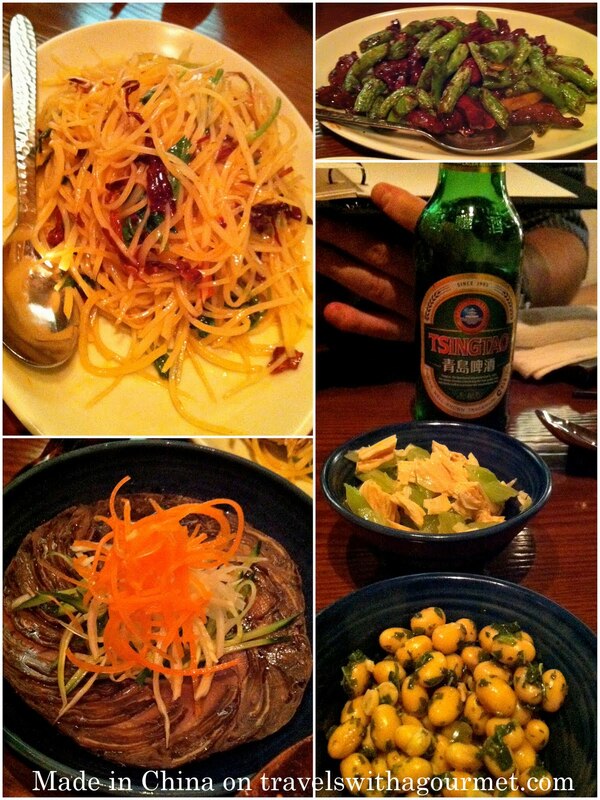 In the meantime, L who is a fluent Mandarin speaker, proceeded to order several dishes to share family-style. As soon as we had ordered, they set down two tiny bowls – one with herbed soya beans and another of tofu and cucumber, both delicious and a good sign of what was to come. The dishes started coming one after another soon after – shredded potatoes with chili, cold braised beef shank with pickled vegetables, spinach leaves smothered in a creamy peanut sesame sauce, sauteed beef and green chili peppers, stir-fried vegetables with dried white shrimp and pot stickers. The food was hot and delicious – each one distinct in flavor and a far cry from our lackluster lunch near the Great Wall. The stir-fried vegetables, mostly cabbage, was made distinct with the addition of tiny, dried white shrimp giving the dish a salty kick. Especially good were the pot-stickers – crunchy and gooey fried dumplings that came served with a lace-like crispy cover and a tray of sauces to mix together – black vinegar, soy sauce, chili oil and a tiny amount of white liquid which turned out to be the secret ingredient – a sinus-clearingly-spicy mustard-infused oil which was meant to be used sparingly, except that A put a bit too much in his sauce mix and had to hold his nose for a few seconds after. The dumplings dipped in this sauce were spectacular. This is the kind of Chinese food we had expected to find in China. 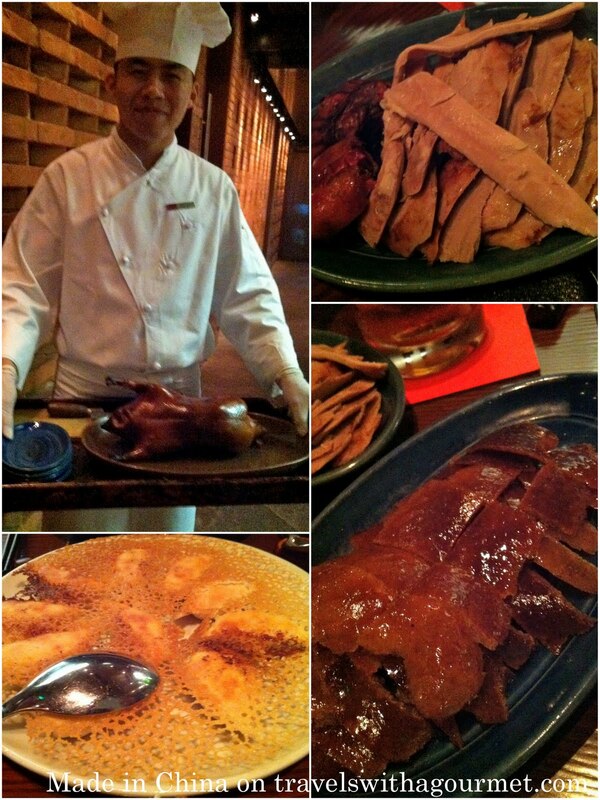 While we were enjoying our food, the chef came out carrying a tray with our whole Beijing duck. After presenting it to the table, he proceeded to slice the skin off then the meat which he served in separate plates along with the usual accompaniments of pancakes, Hoisin sauce and shredded spring onions and cucumber. What was unusual was two other things they served with the duck – a tiny container of sugar and another of pureed garlic. Apparently, the way to eat the duck was to dip the extra-crispy skin in sugar and eat them like crackling. (Just writing this makes me want to fly back there and have the Beijing duck all over again). The garlic was meant as another spread to add onto the pancakes along with the duck meat and the other condiments. When in China, do as the Chinese so we proceeded to snack on the crunchy, salty, skin dipped in sugar and had several rolled pancakes of duck meat. Having this version of Beijing duck has spoiled me for life and from this day onwards my Beijing duck standard has been raised. When we were just about finished, the second part of our Beijing duck dinner came – a bamboo tumbler of steaming hot and flavor-rich consomme made from the duck carcass. We finished off our meal with a quick look at the dessert list. 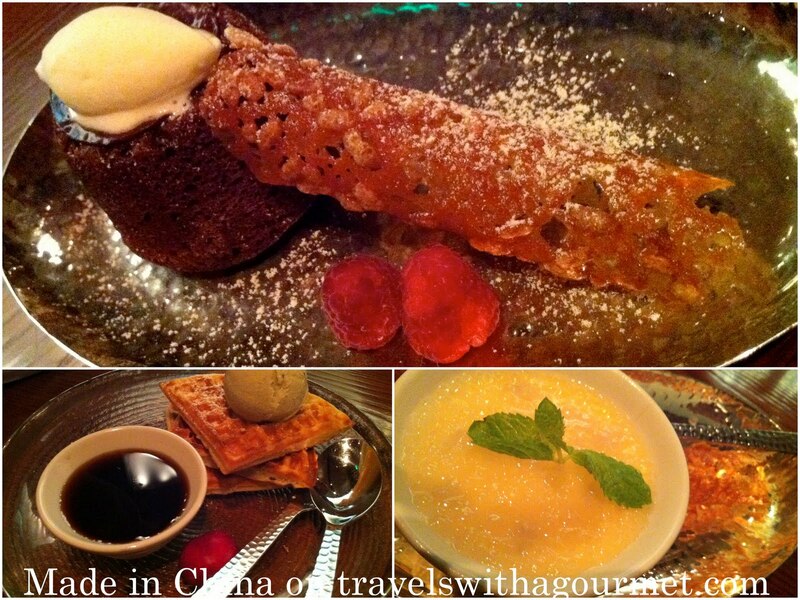 R & I shared the mango pudding – a mousse-like mango topped with sweet tapioca, L had the Szechuan pepper chocolate pudding – a modern Chinese take on the typical soft-centered chocolate cake and A had coconut waffles with a Pandan-flavored ice cream. Espressos for us and a glass each of Chardonnay for R & L before we rolled ourselves out of the restaurant and finished what was our best meal in the two days we were in Beijing. If we had stayed longer, I would have gone back for another chance to eat that delicious duck.